It’s that time of year again when All of Us or None, a project of LSPC, organizes an event to give bikes and other gifts to children with parents in jails & prisons throughout California. The Annual Community Giveback is supported 100% by donations & volunteer time. 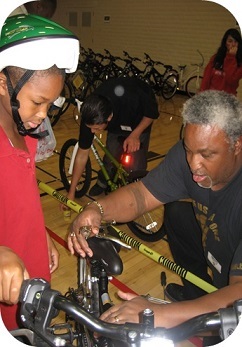 Please consider the sponsoring the purchase of a bicycle we can give to a child on behalf of their incarcerated parent. Indicate below which Community Giveback you’d like to support. Thank you! "I will love my new bike. It means Love." YES, I will sponsor All of Us or None's Community Giveback. Legal Services for Prisoners with Children has partnered with Network for Good to securely process your online credit card payment via Network for Good (tax ID 68-0480736). This transaction will appear on your credit card statement as "Network for Good." This transaction is subject to Network for Good’s Privacy, Security & Disclosure Statement and the Charitable Solicitation Disclosure.